We don't care how the character entered the discard pile (destruction, sacrifice etc. ), in order to use the card's response; right? Normal leaving play of characters via destroy, sacrifice or discard* for any player works. Yeah, from play I meant too. Besides, I do not think that a card that gets discarded from hand ever has the time to become a character. A character card in your hand is still a character card, it's just not in play and thus not eligible for any effects that would say "target a character" and the like. I don't know why you would impose the restriction "after a character enters the discard pile from play" on the card if it isn't written there. Compare with a card like Arcane Hunter (TOotST) where that condition is stated. As I read it, this does exactly what it says it does, nothing more and nothing less. So if an opponent's Clover Club Executive (SotD) made you discard a character (or vice versa), I see no reason why Muddy Waters wouldn't trigger. This is actually a very nitpicky rule, but I don't think characters in your hand and any out of play locations are technically character cards. For example, a Painter of Delusion (SotM) cannot cancel the ability of Master of the Myths (IT), because when triggered from your hand it isn't a character ability. Q: Hi Damon, quick question prior to Worlds next week: If someone triggers Master of Myth's action from their hand, can a Painter of Delusion cancel the effect? A: No. Master of Myths is a triggered card effect when in hand, a character ability only exists on character cards that are currently in play. So based on this I'm not sure if Muddy Waters would fire. There probably was some ruling on this, but i don't remember it, and MOM vs Painter of delusion ruling doesn't apply here IMO. Trying to cancel Master of Myths while it is still in your hand is a very different thing. In terms of temporary characters like the guardian pillar, if an effect caused them to be discarded from play while they are committed to a story as a character then it would still count as discarding a character, but since muddy waters doesn't trigger until after they actually enter the discard pile (meaning the entire discard action must be fully completed) then at that point the pillar would no longer be committed to a story as a character but would be a support card in your discard pile. All that has to happen to trigger Muddy Waters is for a character to enter someone's discard pile. How it gets there or where it comes from doesn't matter. In play or out of play, a character card is still a character card. The only exception to this is a support or event card that has transformed in to a character card. 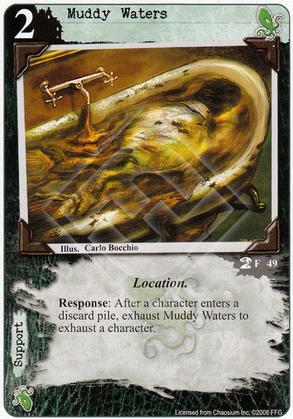 These cards are considered character cards while in play, and while leaving play; however they revert to their original card type once in the discard pile and would not provide a trigger for Muddy Waters. Does Guardian Pillar’s (Dreamlands F78) ability allow it to be committed outside of the normal phase when characters can be committed to stories? No, Guardian Pillar’s ability allows it to be committed as a character to a story. This is during the normal timing window when characters are committed to stories. Also, it is important to note that Guardian Pillar is no longer a support card while it is a character, and that it does retain its name and uniqueness. If I use Hound of Tindalos’s (Core F110) triggered effect to attach it to a character (which makes it into an Attachment support card), and it is destroyed, does it count as a character or support card leaving play? The Hound of Tindalos will count as a support card leaving play. However, it will revert to a character once it is in the discard pile. See also 1.6 Card States for other interesting reading, although this is not relevant to Muddy Waters.